Caramel. Apples. Cheesecake. That’s pretty much a trifecta of awesomeness, wouldn’t you say? These bars are also awesome because they’re so darned easy to make! A classic graham cracker crust, a simple cheesecake batter, and a can of apple pie filling are the base for this dessert. Then it’s topped with a luxurious caramel sauce and topped with flecks of sea salt. Which let me just say that the salt really made it. I used fleur-de-sel…the creme de la creme of sea salt. It’s best when used as a finishing touch, and it really was perfect here. But any finely milled sea salt would be just fine. The slight salty crunch on top of the bars was absolutely delicious! I also used my homemade caramel sauce that I always have tucked in the fridge. If you’ve never made it, or been intimidated by making caramel – don’t be! I used to be that way, but after seeing how easy it is and how delicious the results are – you’ll kick yourself for not trying it sooner. And, the sauce is much less temperamental than the soft candies that you eat, so it’s a great place to start! The husband still talks about these bars, so I know I’ll have to be making them again soon. I was so happy with how they turned out and how beautiful they looked – how the apples are suspended perfectly in the cheesecake? I was worried they’d sink – but they didn’t. I used Lucky Leaf pie filling, which is always my go-to choice when using a pie filling – just because I know it’s always high quality ingredients. The apple filling wasn’t too wet, which I think really helped to get the consistency that made these bars turn out so perfect! What are you guys up to this weekend? After two more snow days earlier this week, I’m ready for some warmer weather. We’re looking forward to a trip to the Ocean City to check out the Spring Trade Expo put on by the Hotel-Motel-Restaurant Association – aka “the food show”. It’s a chance to sample all kinds of different goodies. I know Jon is looking forward to checking out some of the new breweries in the region, and sampling their products. I think some Thrasher;s and lunch at The Shark are also going to have to be on the menu. Should be a good time! I hope everyone has a great weekend. Heat oven to 350 F. Line an 8×8-inch baking pan with aluminum foil and coat with non-stick spray. Set aside. In a medium bowl mix the melted butter, graham cracker crumbs,sugar, and cinnamon until crumbly. Using the bottom of a drinking glass, press evenly and firmly into the bottom of the baking pan. In large bowl combine the cream cheese, sugar, eggs, and salt. Beat at medium high speed, until mixture is smooth, about 1 to 2 minutes. Carefully fold the apple pie filling into the cheesecake mixture. Spoon mixture evenly on top of crust. Bake uncovered for about 1 hour, or until filling is set. Let cool completely. Once cooled slice the cheesecake into 2-inch squares. Drizzle caramel sauce on top of cheesecake pieces and sprinkle with a little sea salt. 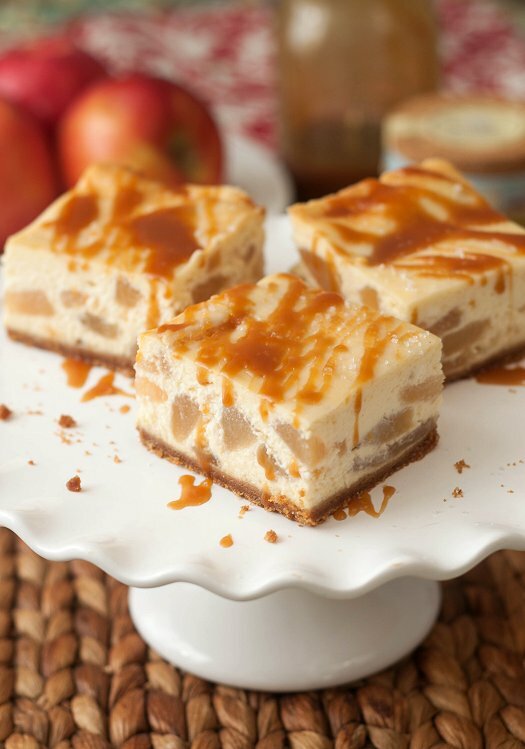 As a huge fan of apple AND cheesecake I’m delighted in seeing your recipe! I absolutely love it! ! Just dropped in to say “Thank YOU”. I made these bars yesterday and these tasted great. I also made your salted caramel sauce to go with it. Both were yum!! Are you on Twitter? Thanks so much! And, indeed I am – find me at @tideandthyme. I made these bars today and they were delicious! I’m sure to make them again sometime soon, but when I do, I’m going to to use less eggs. Maybe like only one. The texture was more like a custard instead of a cheesecake. I’m not sure, I’m thinking probably not.